wonderfullyflawed: And . . . it's over! And . . . it's over! Well, after 32 treatments, it's done . . . I rang the bell and got the certificate and said good bye. There was only one glitch . . . 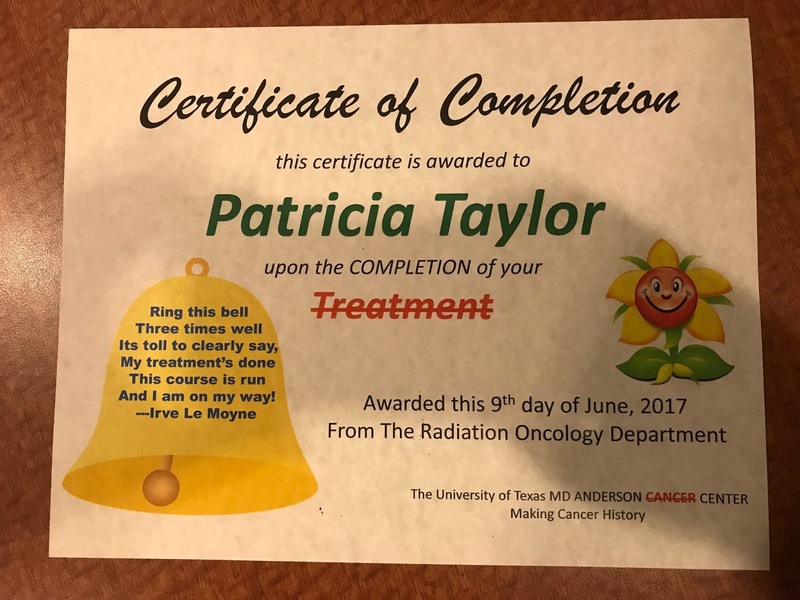 The tradition is that on your last day, you bring treats for the waiting room, the front desk and your radiation team. I also wrote a few thank-you cards to include with the treats. As I was lying on the table waiting for my treatment, the radiation team told me over the speaker, "We just read your card and we're crying." I thought that was really sweet but a little surprising . . . I mean, the card was sweet but I figured that they heard thank-you from patients all the time. Well. A little later, when I was digging in my purse for the card that I had written for Craig, I realized that I had gotten them mixed up and had included Craig's card in their treat bag. The first thing I did was to think about what I had written and realized, thankfully, that there was nothing inappropriate! But they definitely got a different kind of thank-you than I intended--way over the top! 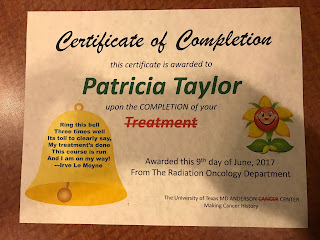 I was terribly embarrassed but Craig reframed it as a "happy accident" that blessed a really top-notch radiation therapy team so we're going with that. Now I'm even happier that I don't have to go back!